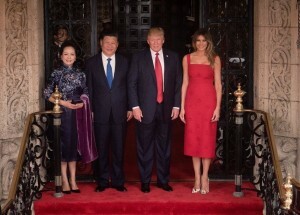 U.S. President Donald Trump and Chinese President Xi Jinping met on Thursday, April 6 and Friday, April 7 at Mar-a-Lago Resort in Florida. Delegations of high-level officials from both countries were also in attendance. The Mar-a-Lago meeting was not an official state visit, and seems to have been quickly put together. President Xi visited the United States following an official state visit to Helsinki, Finland. President Trump and President Xi were expected to discuss North Korea’s nuclear development, trade and investment, and the South China Seas island disputes. Official state responses have thus far been positive. In a press conference on April 7 President Trump reported “tremendous progress in [the U.S.’s] relationship with China”. President Xi remarked that the two leaders have “gained better understanding of each other, cemented their mutual trust, scored many major consensuses, and built up a good working relationship.” Chinese Foreign Minister Wang Yi has said the talks were “positive and fruitful.” According to Secretary of State Rex Tillerson, the biggest development to come out of this meeting is a “new high-level framework for negotiations” called the “U.S.-China Comprehensive Dialogue. This dialogue will have four focuses: diplomacy and security, economy and trade, law enforcement and cyber security, and social and cultural. Chinese media considers this to have been a successful meeting between two countries with a complex relationship. David Gosset, a global affairs analyst and Sinologist, commented in Xinhua that the two leaders “stayed focused on the indispensable cooperation between China and the U.S..” The South China Morning Post also praised the two countries’ cooperation, reporting that a “firm foundation has been laid” for future improvement of the relationship. China Daily agreed, saying that both the U.S. and China were “equally enthusiastic about the constructive relationship they have promised to cultivate.” This meeting was also beneficial for President Xi’s political maneuvering in China. Political commentator Zhang Lifan claimed “Xi’s target is to stabilize the Sino-US relationship at all costs” to put him in the best position for the Chinese Communist Party Congress later this year. Lifan claims that this meeting has ultimately moved Xi towards achieving that goal. President Trump has previously been critical of China for their effect on the American economy. Secretary Tillerson said President Trump “[stressed] repeatedly the need for reciprocal market access” during these talks. However, American reports were not satisfied with the lack of tangible results on trade policies. According to the Washington Post, business leaders expected announcements of Chinese investments in the U.S. to come out of this meeting, but it appears no such offers have been made. Jacob Parker, at the U.S.-China Business Council would like to see “more results-oriented outcomes coming out of these new dialogues,” but overall thought the meeting was “generally positive” on trade issues. A “100-Day Plan” to address trade relations between the U.S. and China has been set in motion. This initiative is a part of the new U.S.-China Comprehensive Dialogue. Commerce Secretary Wilbur L. Ross acknowledges that the 100-day timeline may be ambitious, but he also believes that this plan is a good change of pace between the two nations and symbolizes the “growing rapport between the two countries.” Very little detail is available on the specific goals of this plan. White House Press Secretary Sean Spicer reported that China will open their markets to the American beef imports. Although there are no actual changes to trade agreements yet, Spicer said beef imports will be part of negotiations for a coming trade agreement. Xinhua also reported that China invited the U.S. to join “One Belt, One Road”, an initiative that focuses on trade expansion on the trading routes of the historic Silk Road. Despite the movements in trade negotiations between the two countries, there have been no clear developments in a joint agreement on North Korea. According to Secretary Tillerson, the discussions were “very wide-ranging, very comprehensive” but focused on “both countries’ previous commitments to denuclearize the peninsula.” The two countries have agreed to increase cooperation, but no agreement was reached to resolve the tensions created by the continued development of North Korea’s nuclear program. According to the New York Times, some analysts believe the U.S. strike on a Syrian airbase the evening of April 6 was a demonstration of the U.S.’s willingness to mount military strikes against North Korea if China does not do more to impede their nuclear development. However, some do not believe this strike was a message to China. Others, like Shi Yinhong, a professor of international relations at Renmin University, are convinced this strike was a “defensive measure to deal with criticism against [Trump]” from his political rivals in the United States. While this meeting does not seem to have any concrete results yet, it has created an opportunity for continued dialogue between the two countries on their shared issues. Trump has accepted Xi’s invitation to visit China on an official state visit later this year.